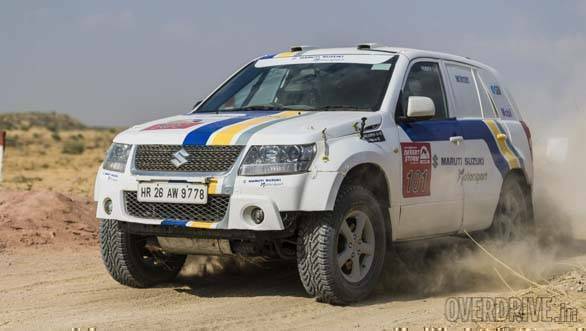 Abhishek Mishra (co-driven by V Venu Rameshkumar) continues to lead the 2018 Maruti Suzuki Desert Storm at the end of the penultimate leg. There were four stages in all, including a night stage that turned out to be pretty challenging. To add to the difficulty, the drivers as well as riders in the Moto Class were mandated to use a road book scroll to navigate only. Use of GPS was banned for this leg. With the last leg consisting of a short stage, it is Mishra's rally to lose. However, Raj Singh Rathore, who stands second after Leg 4 is expected to keep pushing hard in hope of snatching the title potential title from Mishra. Rathore is driving his Isuzu Dmax V cross almost flat out at every stage and has covered quite a lot of ground to be in a position to win. Maruti Suzuki Motorsport's Sandeep Sharma had a disastrous outing on Leg 4. He was caught out by the depth of the sand at one stage, which caused his Maruti S Cross to sink in and beach itself. A tractor have to be summoned to pull the car out. This however caused some mechanical problems due to which Sharma was forced to retire. If that wasn't enough, Maruti Suzuki Motorsport's Dharampal Jangra also had to retire after his Vitara Brezza suffered mechanical gremlins. In the Moto Class, Aaron Mare of team Angata Racing is at the top of the board, closely followed by TVS Racing's Lorenzo Santolino.